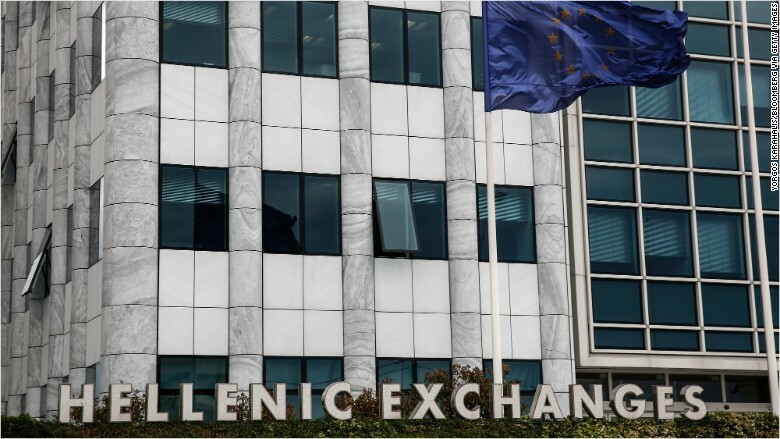 The Athens stock exchange will reopen Monday, more than a month after Greece's financial crisis forced the authorities to suspend all trading. But there will be some restrictions for local investors, the Greek finance ministry said, to prevent more money flooding out of the banking system. They will only be allowed to buy shares with existing holdings of cash, and won't be able to draw on their Greek bank accounts. Greece's banks were bleeding cash at a furious pace on fears the country's debt crisis would force it to abandon the euro. Capital controls were introduced on June 29, including the closure of banks and financial markets. ATM withdrawals were limited to 60 euros ($66) per day. The banks reopened on July 20, after Europe agreed in principle to a new bailout, but withdrawals remain limited to 420 euros ($455) a week. Some capital controls have been relaxed, so Greek companies could make payments abroad. Shares in the biggest Greek banks were tanking before the market closure -- Piraeus Bank (BPIRF) lost 57% this year, while Alpha Bank (ALBKF) is down 29%. The benchmark Athens index has dropped 32% over the last 12 months. The European Central Bank has approved the reopening of the exchange. The ECB doesn't control the stock market, but its opinion is crucial because it is keeping the Greek banking system afloat with regular injections of cash. Greece has begun negotiating the details of its third bailout with international creditors this week. The bailout could be worth as much as 86 billion euros ($96 billion). Europe handed Greece an interim loan worth 7 billion euros ($7.8 billion) to allow it to make crucial payments to the IMF and the ECB. There's another big repayment due to the ECB on August 20.